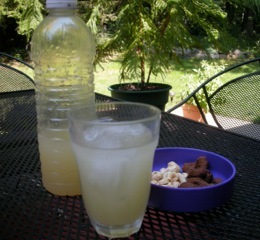 Last week, along with the bissap, I prepared several liters of ginger beer for my trip to Hershey. It was with a shock that I realized that I've never posted my simple recipe for this soft drink popular throughout sub-Saharan Africa. Ginger beer is often carbonated, and made with yeast, but this version skips that step. I still like the bubbles, so I simply use seltzer (carbonated) water to dilute the concentrate to taste. It's always fun when folks shake their heads and say with awe: "You made this from scratch?" I usually peel the ginger root (unless it's organic). I just learned how easy it is to use the back of a teaspoon (thank you, Ann) rather than a vegetable peeler. The first time you make this, you should probably start with about 4-5 ounces of ginger until you have a sense of how strong you want it. Pour 2 cups of boiling water over the ginger and let it sit for at least 2 hours. Line a strainer or colander with a cheesecloth that has been folder several times, and set it over a large bowl. Slowly pour the ginger-water mixture through the strainer. Pick up the cheesecloth by the 4 corners, then twist and squeeze it to remove as much of the water from the cheesecloth as possible. Discard the ginger in the cloth. Add about 2 cups of cold water to the liquid in the bowl (more or less depending on if you want to dilute it with seltzer water later or not), and up to 3/4 cup of sugar (or more if you like it really sweet), stirring to dissolve it. Add the lime (or lemon) juice, cloves, and cinnamon (if using) and let the mixture sit for another hour before removing the spices. Carefully pour the ginger beer into a pitcher or covered container. Store, covered in the refrigerator. Variations: increase or decrease the ginger or sugar or replace it with honey, substitute fresh pineapple chunks (including the peel, if organic) for the cloves and cinnamon, and add it with the original grated ginger. Serve the ginger beer well chilled (over ice cubes if you're North American and like "ice blocks" as in the photo above), and diluted to taste with water, seltzer water, or even ginger ale. I use about 1/2 cup of ginger beer per serving. It's said you can mix in some rum, vodka, or other alcohol, but I've never actually tried it that way. Come to think of it, this is just as well a spicy, refreshing drink for the fall. Labor Day picnics, anyone? We make it just about the same way in the Caribbean... I guess the method came over with us on the boat.